Tenoch Huerta as Ricardo Sr.
"Stand Clear of the Closing Doors" is one of those films of which detractors say "nothing happens" and fans say "everything happens." Its hero is a boy named Ricky (Jesus Valez) who lives with his family in the beachside neighborhood of Far Rockaway, Queens. He has a spectrum disorder. His 15-year-old sister (Azul Zorrilla) walks him home from school every day because he has no concept of danger. She's easily irritated by her brother, who's a handful even when he's in a quiet mood, and is prone to sudden, bizarre actions and gestures. Ricky's mother Mariana (Andrea Suarez Paz) dotes on him, while worrying that he'll never be able to live by himself and that his condition is just barely manageable. The bulk of the film consists of the world as Ricky sees it while he's out in the city. And it's in these scenes that "Stand Clear of the Closing Doors" becomes much more than a New York indie about immigrants surviving on the city's mean streets. Screenwriters Rose Lichter-Marck and Micah Bloomberg and director Sam Fleischner have conceived Ricky's journey in mostly subjective terms. We're seeing the city not just as a boy would see it, but as an autistic boy would see it. The crowds of people on the streets and in subway platforms seem to be smashed into each other, like layers of tile in a mosaic mural. There are long moments where we gaze at a particular moment of behavior (a person lost in thought, a hip-hop dance troupe going through a routine) and drink it in. Sometimes we're just staring out of windows when the train is aboveground as buildings and roads whoosh by. When the train goes underground the photography (by Adam Jandrup and Ethan Palmer) and editing (by Talia Jarrett) become slightly more abstract, at times free-associative. Ricky is fascinated by patterns and circles, and by patterns of circles, and the subway has plenty of those. During a stunning long take from Ricky's point-of-view staring through the front window of a subway car, the focus shifts so that the lights lining the tunnel become blobs of energy streaking towards us. Here, as in other moments of "Stand Clear," we seem to leave the everyday world and enter a world of sensation and energy. The effect is science-fictional. We might as well be Dave Bowman at the end of "2001." 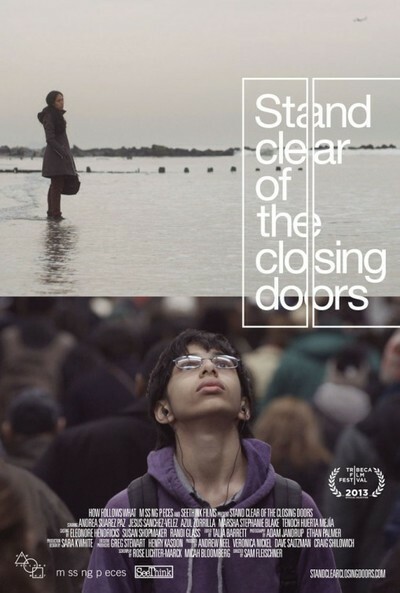 Like its hero, "Stand Clear of the Closing Doors" goes with the flow and has a chaotic and thrilling time but doesn't know where to go or what to do with itself. Stunning as many of the film's subjective sequences are, they grow repetitious during the story's final third. So do the scenes of Ricky's mother and sister waiting and worrying. Still, the film's vision is original and beguiling. Portions of the movie were shot during Hurricane Sandy, and those portions have an even stronger and more immediate documentary flavor. The filmmakers have taken their cues from films that reached for something more than straightforward point-A-to-point-B storytelling. "Stand Clear" is less about what happens than what it feels like. It's a marvelous city film, not as fully realized as "Berlin: Symphony of a Great City" or "The Little Fugitive" (which its running-away-from-home narrative and seaside origin points evoke), but made in the same questing, generous spirit. You can show it to people to explain what life probably feels like to someone with a spectrum disorder. The film also has tremendous (if incidental) historical value. A copy of it should be stored in a climate controlled vault, for the benefit of future generations who want to know what life in New York looked, sounded and felt like in in the early 21st century.